The Revenue Mobilisation Allocation and Fiscal Commission (RMAFC) says it has begun processes to review salaries and allowances for political, public and judicial office holders. This is contained in a statement on Wednesday in Abuja by the Head of Public Relations, RMAFC, Mr Ibrahim Mohammed. According to the statement, the Chairman of the commission, Mr Elias Mbam, announced this while inaugurating members of the Remuneration Committee charged with carrying out the review. Mbam said the exercise was in line with the current realities where the economy was characterised by inflation and downturn in international oil prices, among others. In carrying out the exercise, he urged the committee to be conscious of the prevailing economic situation and the need to reduce cost of governance to free more funds for development. 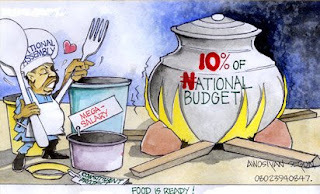 The News Agency of Nigeria (NAN) reported that the RMAFC website revealed that the current annual salary and other allowances of the president stood at about N14 million. That of the vice president is N12 million and ministers, N7.8 million. The senate president earns N5.5 million yearly; his deputy, N5.1 million. Other senators earn N5 million. In the House of Representatives, the speaker earns N4.3 million; his deputy, N4.2 million while other members earn N4 million annually. "The commission is constitutionally empowered to undertake the review of the remuneration packages as may be required from time to time so as to reflect current economic realities. "RMAFC is also mandated to advise federal and state governments on monetisation policies, generate cost of living indices for revision of allowances, among others. "To this end, the committee will undertake wide consultations with all critical stakeholders, including all arms of government of the federation. “This includes the national and state assemblies, states and local governments, and professional economic bodies," he said. Mbam said the organised labour, the academia, the media and the Nigerian public in general would be consulted to enrich the process. He urged the committee to ensure that the review effectively minimised wastage and abuses and ensured prudent management of resources as well. He stressed the need for the committee to derive an appropriate remuneration for political, public and judicial officers, commensurate with the work they do. The RMAFC boss said the exercise would be completed before the end of September 2015.